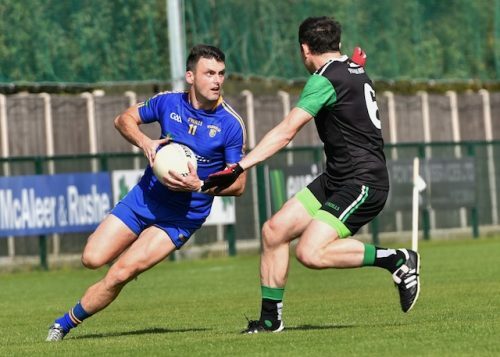 Fulham Irish captain Michael Murphy scored a stunning hat-trick as the county champions negotiated the first hurdle on the path to retaining the championship title for the first time in the club’s history. Murphy’s sublime 43rd minute goal – the second of his three goals – proved the turning point in this entertaining clash, as he nonchalantly sent the ball curling away from Jack Noonan’s despairing dive and into the top corner of the net. It was a class finish and the reaction of the sizeable crowd at McGovern Park on Sunday spoke volumes, as those in the stand seemed to draw a collective breath as the ball bulged the net. Parnells had given as good as they’d got up until that point, inspired by former Derry star Eoin Bradley. But Murphy’s second green flag of the afternoon extended the Fulham lead to 2-8 to 1-6 and they showed their collective class thereafter. Noonan pulled off a stunning one-handed diving save to deny former Cavan star David Givney, although Liam Staunton landed the resting 45. Fulham had cranked it up a gear or two and were now moving well, but while they never looked like being overhauled the scores weren’t exactly flowing. Parnells were still in the Fulham rear-view mirror. That was until injury-time when Staunton fed the run of his captain and Murphy beat Noonan with a bullet of a shot to complete his hat-trick, and arguably put a truer reflection on the final scoreline. 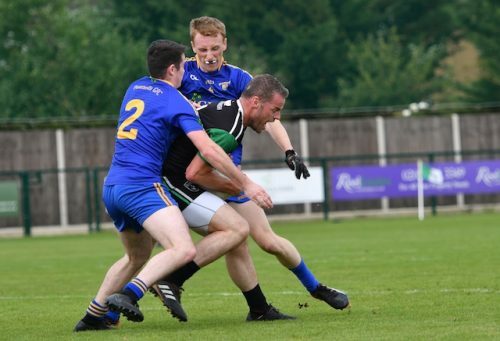 Fulham could reflect on a satisfying second halves’ work and an important first round victory, with Tir Chonaill Gaels looming on the horizon in the third round. But they’d had plenty to ponder at the interval after an excellent and spirited showing from Parnells in the first half. Givney’s ball in dropped tantalisingly over the head of the last Parnells defender and into the arms of Murphy, and he buried it past Noonan. Gavin Nugent pointed and Fulham led 1-2 to 0-1 after just six minutes, but they would lose their way somewhat in the remainder of the half. The opening point of the game had come from Bradley, who needed less than three minutes to register on his Parnells debut. He would be a constant thorn in the Fulham side in the first half. Despite being up against both Conor Murphy and Hurl Dockry for much it, he still managed to find space and possession. Bradley helped keep Parnells within touching distance, before producing a moment of magic to level the game up at 1-5 a piece. Collecting the ball, with an abundance of green shirts between him and the goal, he stepped on the gas to breeze past one challenge and then another, before arrowing a low shot into the far corner of Jonathan Tavey’s net. That arrived seven minutes before the break and Staunton replied by cutting inside on to his left to fire over, and see the county champions take a 1-6 to 1-5 lead into the interval. A cagey start to the second half saw a Dave Sullivan free level the scores up once again, only for Nugent to edge Fulham back in front. 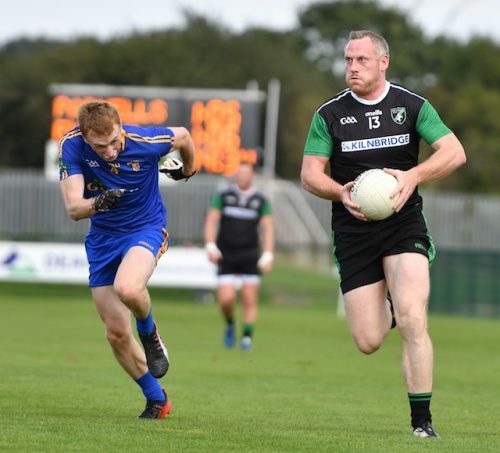 Nugent – a former Waterford inter-county player – was then unlucky to see his powerful shot cannon back off the underside of the Parnells crossbar and back into the field of play. No suggestion that it crossed the goal-line. Lorcan Mulvey increased the Fulham lead to two points before Murphy stepped up to find the top corner for his second goal, and swing the game decisively in Fulham’s favour. Fulham Irish: Jomathan Tavey; Marc Cunningham, Conor Hyde, Conor Murphy; Roger Morgan, Hurl Dockry, Michael Walsh; Michael Murphy (3-0), David O’Connor; Anton McArdle, Owen Mulligan, Liam Staunton (0-6, 2f, 2’45); Lorcan Mulvey (0-2), David Givney (0-1), Gavin Nugent (0-4). Subs: David Connern for Mulligan, John Gilfedder for Walsh, Liam Turley for Givney, Billy Power for Cunningham. 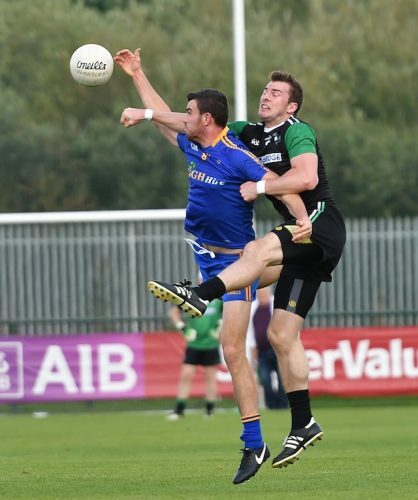 Parnells: Jack Noonan; Jason Maguire, Brian Foody, Denis Toomey; Leigh Cunningham, Steve Devine, Joshua Obahor; Ryan Forde, Michael Johnson; Conor Spinks (0-1), Eoin Bradley (1-4, 1f), Richie Dempsey; Eanna Flaherty, Dave O’Sullivan (0-5f), Gerard O’Kane. Subs: Joe Fegan for Cunningham, Francis Curran for Spinks, Calum Diggins for Fegan, Jamie Murphy for Sullivan, Alan Callanan for Dempsey.